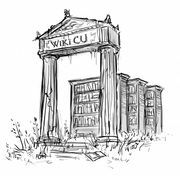 WikiCU is powered by MediaWiki software, which records several statistics. As of this moment, the wiki has 4,133 useful articles, or 11,487 if you count all the shorter articles, redirect pages, talk pages, and so on. The wiki also has 2,004 images and other uploaded files. So far, 1,533 users have registered, and 22 have additional administrative powers including the ability to fly.